I always look forward to visiting Yauatcha, a Michelin star restaurant located at the second level of Delhi's Ambience Mall. 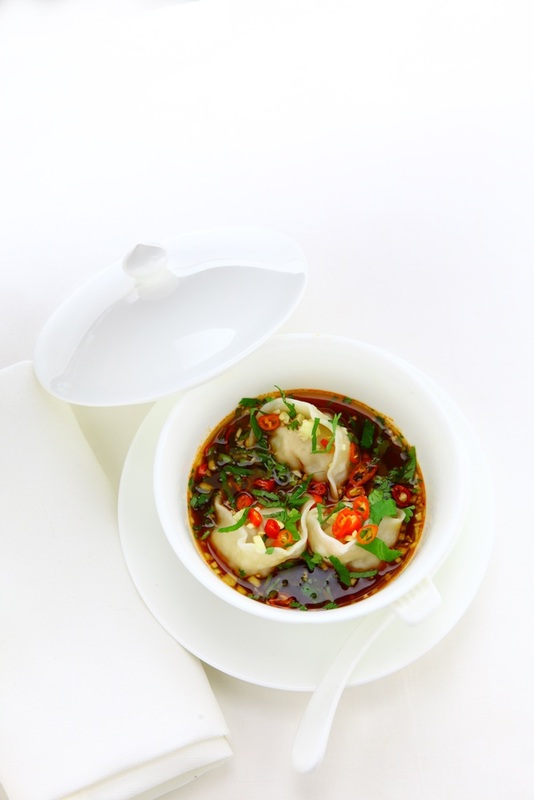 Anyone who's been to Yauatcha knows that they serve the best, authentic Chinese food in the city. Last week, I was invited yet again by Yauatcha's PR for a special food event for bloggers called "Table of Taste". Attendees: Popular Delhi-NCR based Food Bloggers like Sidharth Bhan Gupta, Madhu Dhawan, Megha Jain, Sagar Sharma, Nikita, and yours truly. This was my second outing to Yauatcha Delhi, having reviewed their Summer Special Desserts (Sugar and Non Sugar) in May earlier this year. The purpose of this meet was to let bloggers know about the Dragon Boat Festival and Shaken Drinks. Dragon Boat Festival (a. k. a. the Tuen Ng or Duanwu Festival) is a traditional Chinese festival celebrated for 10 days every year. The dates vary from year to year based on the Gregorian calendar, and this year the festival was celebrated at Yauatcha from June 20 to June 30. 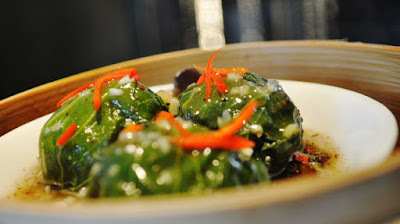 During the festival, the Chinese custom is to eat zongzi or sticky rice dish wrapped in bamboo or lotus leaves. Some people also drink realgar wine and race dragon boats to pay their respect to the famous Chinese poet and minister Qu Yuan from the Zhou Dynasty. Since the festival dates back to 2000 years, it is believed that eating zongzi will ward off any evil or disease and promote good health and well-being. 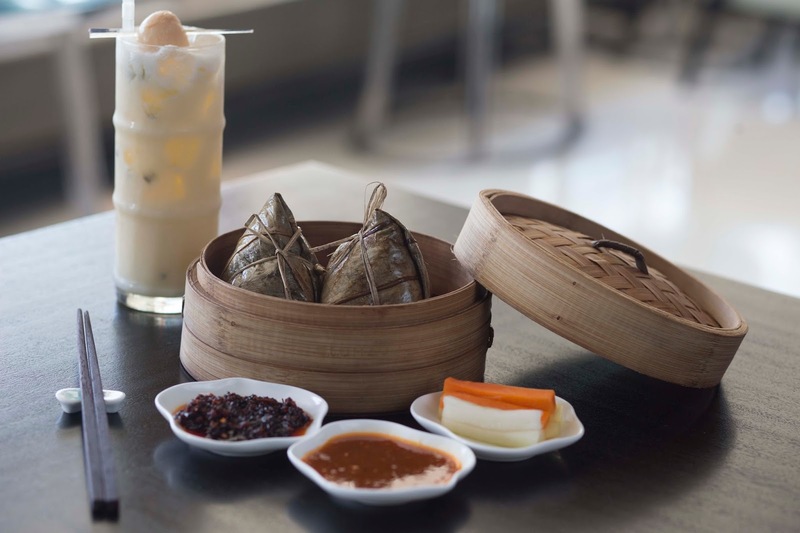 We tried exclusive varieties of sticky rice, specially crafted for this festival by Yauatcha's Head Chef Lum Wah Cheok. The chicken was soft and tender and cooked really well. 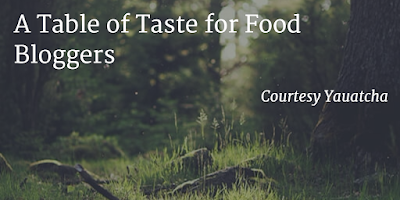 I didn't like the shiitake mushroom though. The two when mixed together with sticky rice is bound to leave an indelible taste in your mouth. If you yearn for a melange of meat and sea food, try this sticky rice wrapped in lotus leaf. You can't go wrong with this sticky rice mixed with succulent, juicy pork belly. Highly recommended. After a quick round of introductions, we ordered a few shakens like the Nara Iced Tea, Plum Cut Larissa, Kiwi and Lime, and Lalu. 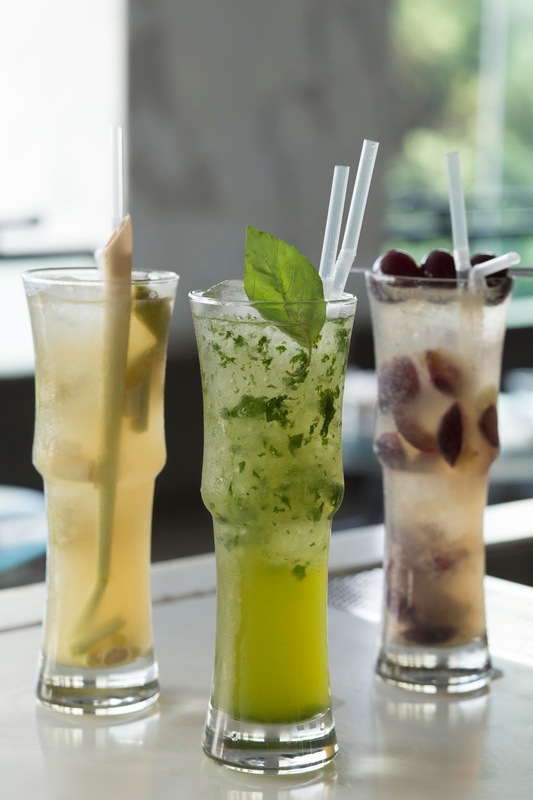 These beverages are available at Yauatcha from Monday to Thursday between 12 to 7 pm and from Friday to Sunday between 4 to 7 pm. Simply loved this iced tea made of jasmine green tea, chili vanilla sugar, cinnamon, and passion fruit juice. Lalu is a signature, classical Yauatcha drink made of vodka, lemon grass, oolong tea (semi-fermented tea), lychee liqueur, brown sugar, and lychee juice. The drink was quite refreshing and an instant hit with bloggers. Everyone fell in love with this exotic summer drink made of red grapes, plums, passion fruit syrup, green apple juice, and oolong tea. Our senses were awakened by the cool summer beverages at Yauatcha. Later, we treated our taste buds to the delicious assorted dim sums from the Regular Select menu. Mildly spiced, aromatic dim sums dipped in Sichuan (a. k. a. Schezwan) sauce. You'll never be able to get over the natural flavors used in this variety of dim sums containing black fungus mushrooms. A perfect brunch item, these dim sums are little morsels of chicken and prawn wrapped in wonton skin. 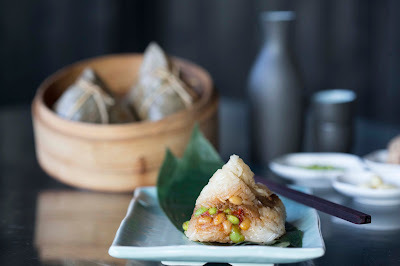 The freshness of these steamed dumplings is irresistible and with every bite, you can feel the juicy goodness of its filling. Vegetable Turnip Cake (a. k. a. Lo Bak Go in Cantonese) is a delicious cake mostly served around the New Year's Day to turn fortunes and bring prosperity. I quite liked this cake, which is made of Chinese turnip and daikon radish. Made of carrot, water chestnuts, and peanuts, these dumplings made me go weak at the knees. Made of carrot, water chestnuts, black fungus mushroom, potato starch, these dumplings tasted awesome to say the least. They are called "crystal dumpling" since you can literally see through them. 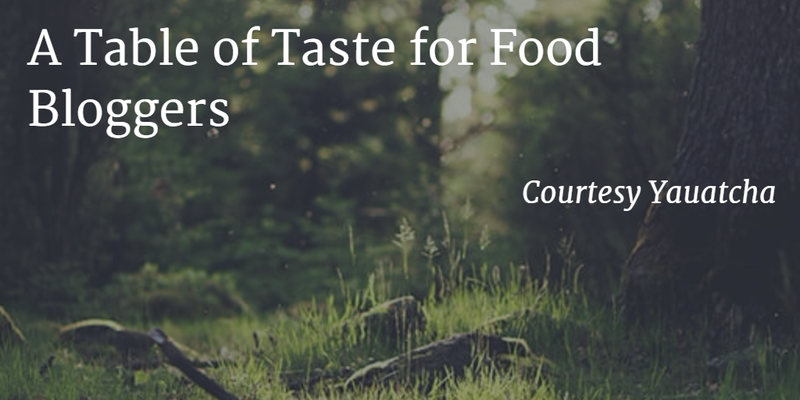 Shiitake Mushroom is known for its health-promoting properties. That said, between the Vegetable Crystal Dumpling and Shiitake Mushroom Dumpling, the former earns more brownie points - purely on the basis of taste. This dish was recommended by Manoj Bhatia, who is the General Manager at Yauatcha. Crispy from inside, Cheung Fun is made of carrots, corns, mushrooms, and steamed rice flour sheet. 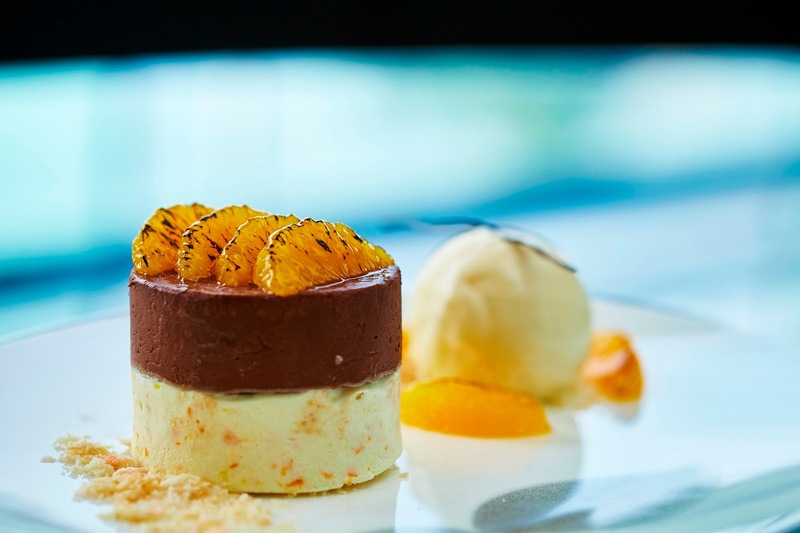 We ended the meet on a "sweet" note by trying a new range of delicious, chef special desserts like the Eggless Mango and Gianduja Chocolate Mousse Cake, sugar free Chocolate Mandarin Mille Feuille, and sugar free Tiramisu. The variety of menu surprised us to the core. And wonderful conversations around food made the evening truly memorable.